I was in Dusty Strings Saturday picking up a few odds and ends and ogling the stock. 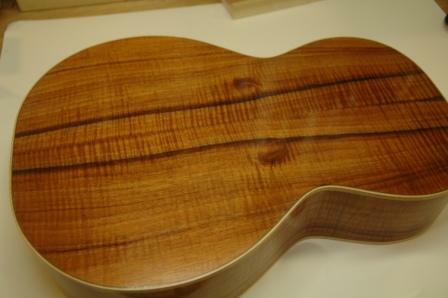 I overheard that ukes are big sellers. The fastest growth in sales over any other item within the store. 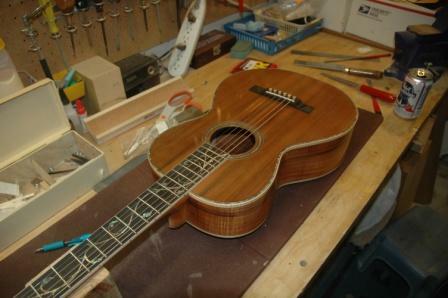 I’ve often considered building ukes, and get plenty of signals that this would be a good endeavor. 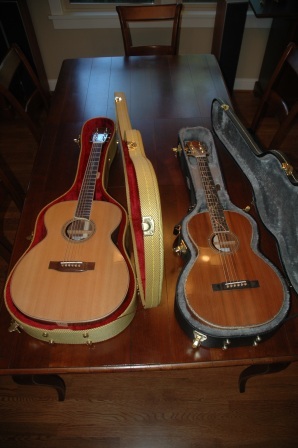 Not that a uke would be that much faster to build (it’s just a tiny guitar after all), but there may be a larger market out there to support sales. 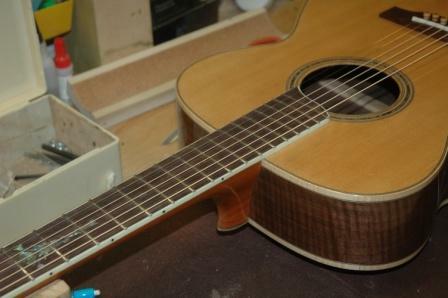 So, I’m on the hunt for some quality uke plans as a starting point, then going to look into what it would take to create a production line for quick turnaround. A lot of time this week has been spent on the building of a router table. I have a router table that sat in my garage (the room for all my power tools) and was made of MDF which sat directly under the largest leak in the garage. Needless to say, there are several leaks in my garage (circa 1910, cracked concrete, mostly below ground level). All sorts of effort has been made to stop the leaks, but none successfully. I’ve resigned myself to draping plastic garbage bags over all my power tools. 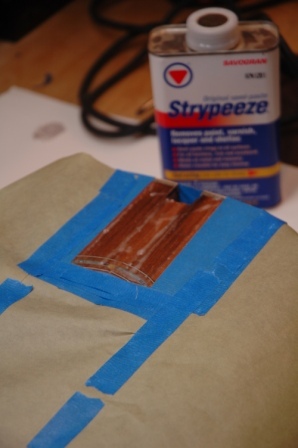 The MDF router table was unusable as it bulged from all the absorbed water over the past year. I used it as a template and constructed a new one out of 3/4″ birch ply finished with lacquer. 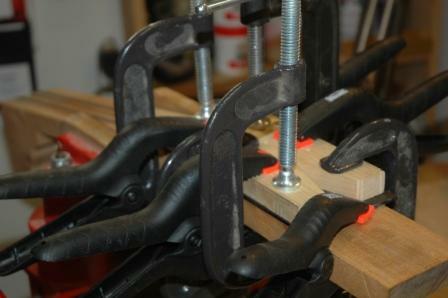 I’ve been aware for some time that a router table with certain jigs is used quite a bit in luthier’s shops. 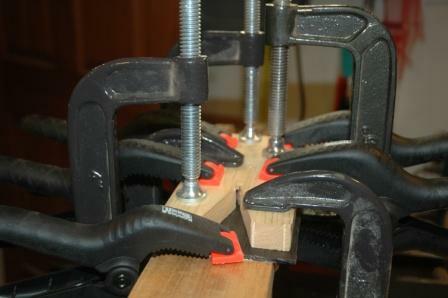 The first use is to radius bracing. 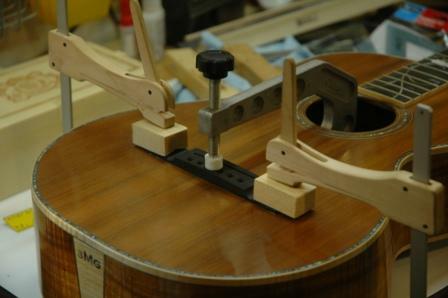 By building a jig that holds the brace blanks and has interchangeable radius templates, one can quickly and accurately radius braces and tonebars. 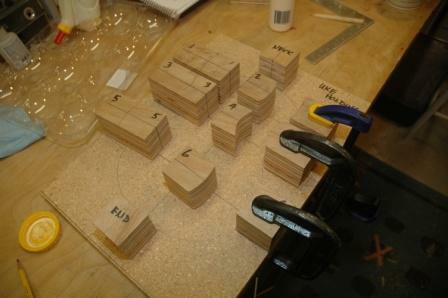 I’ve designed the jig, but haven’t constructed as of yet. My design will allow for any width of brace and any radius that I have a template for (right now I have 40, 28, 20, 15, and 12). I use 28 for the top and 15 for the back on my current guitar models. I’ll post a few pics of the router table and jig once complete. After the neck block extension came out of the clamps, I was able to trim it down and flush it up with the original block. 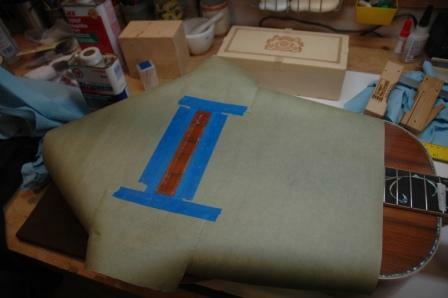 It is now a wee bit oversized, but I’ll trim down the height just before gluing it to the sides. 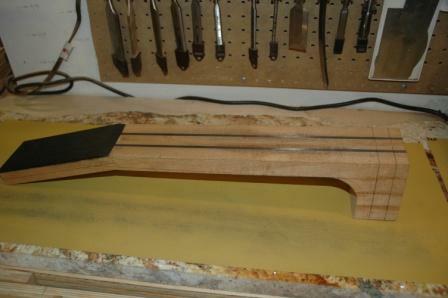 I trimmed up the ebony headstock veneer after it too came out of the clamps. 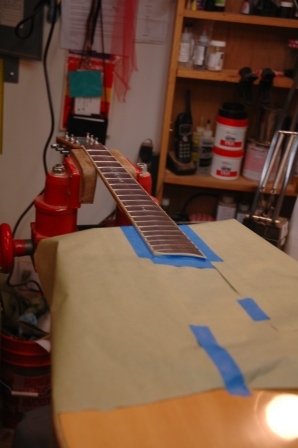 I level sanded the neck where it glues to the fretboard, remeasured where the 14th fret should land and traced out the heel curve, then sanded it out with the spindle sander. I also sketched in the eventual thickness of the headstock and the taper for the back of the neck from the headstock to the heel. After installing a new blade in the bandsaw, I’ll cut to the sketch lines in preparation for initial neck shaping. 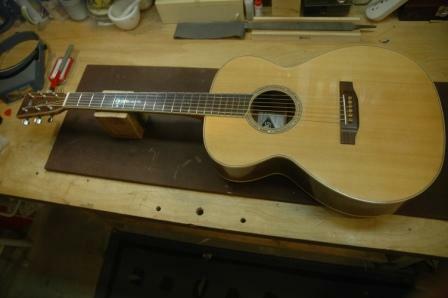 I won’t shape the neck until I receive the headstock inlay, as routing out the inlay channel will be easier to do with a squared headstock secured in the vise. 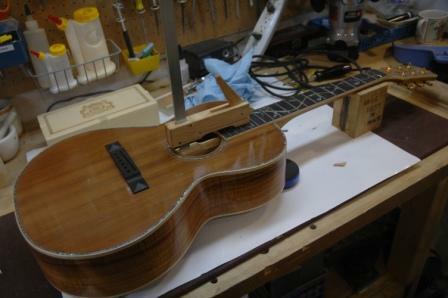 I augmented an OM neck block to accomodate the larger size needed for a dreadnought. 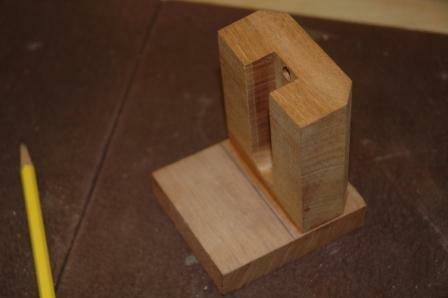 The added piece is oriented with the same grain direction. 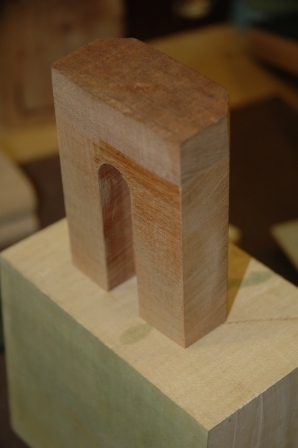 It will be trimmed to match the dimensions of the existing neck block. 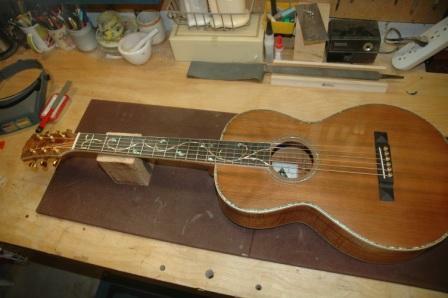 Spent considerable time flattening the top of the neck and the headstock. 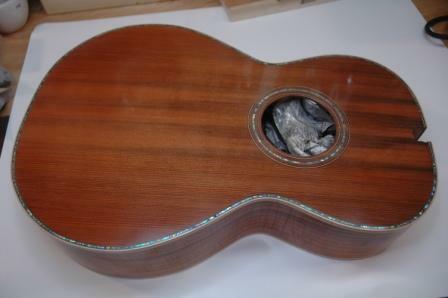 Installed the ebony headplate and will trim down flush with the mahogany once glue sets. I’m waiting for a designed/constructed headplate inlay. 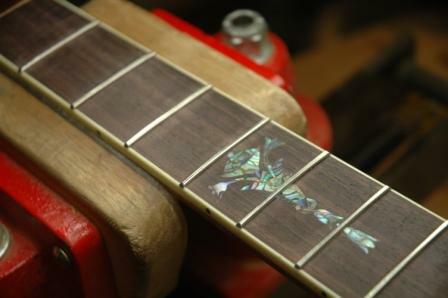 I’ll determine the headstock shape based on the inlay design.